Richard Perza was one of the runners that I was tracking this past Sunday at The Rock n Roll Arizona Marathon. Unsurprisingly, he missed the 10k and the 16.5 mile mats. The above screenshot was taken from the tracking app during the race. To their credit, they had him flagged before the race was completed. He was quickly disqualified. He claimed third in his age group, but had no intermediate splits. I looked at his historical results and found a number of similar results. From 2012 through 2017, he had 7 questionable results including many age group placements, and 6 Boston Qualifying times. (He never registered for Boston). All of the questionable results were at three races over the years: The Cleveland Marathon, Akron Marathon, and RnR Arizona Marathon. He did not stop after I initially wrote about him. In 2016, Richard was disqualified from both The Cleveland Marathon and RnR Arizona. In both cases he had posted Boston Qualifying times. In Cleveland, he had initially won his age group with a time of 3:27:10. They later moved him to the half marathon result. His time in Akron was also suspicious, with inconsistent and missing split times. His Akron time for 2016 was not a Boston Qualifying time. Again, Richard had suspicious results at each race. However, by this point he was no longer “earning” age group awards or Boston Qualifiers. 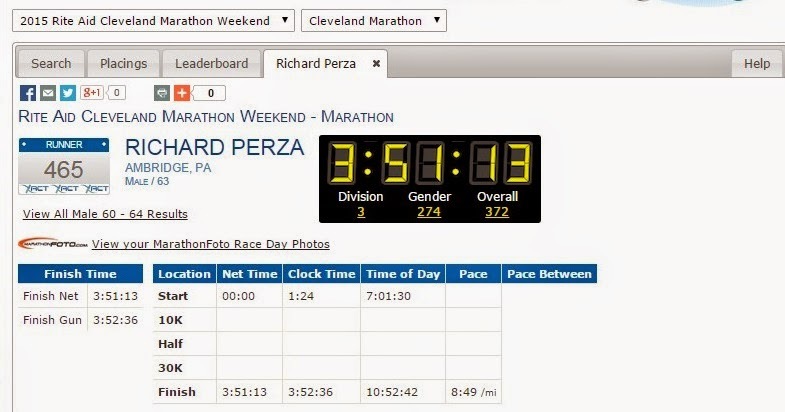 Richard Perza has not recently claimed age group awards and he had never used his times to enter The Boston Marathon. What is his motivation? I’ve been asking that question since I first came across Richard in 2015. If he is not capable of running the Marathon distance, why not sign up for the half, or a shorter event. Over the years, he has stolen numerous age group placements. I cannot figure out what motivates someone to register for a marathon with the intent to cheat. Richard is not on social media bragging of these supposed finishes. I can find no tangible benefit or any reason why he’d register for these races year after year, only to repeatedly cheat by cutting the courses. I ran (well, waddled) the Houston Marathon, yesterday. Every time I crossed a timing mat (especially at mile 13 on the out and back)I thought marathoninvestgations.com and what possess someone to cheat. Its like golf. the highest possible assessor of your own integrity over the training and running is yourself. Honesty is all. If you cheat, you are a cheat. You belong somewhere else, and you probably need help. challenging yourself is about just that, which is what running, golf, and a few other individual sports are all about. cheers Derek. Maybe he’s too addicted to it now to be able to stop himself? Maybe he likes to show medals to his family & friends to get himself an ego boost? This is one of those investigations which makes me wonder what the purpose of this site actually is. So you give his full name, even though he only cheats himself. Which is a mystery, but yet he didn’t harm anybody. The psychology behind this in indeed interesting, but seriously this was never what this site was ever about. This site is about calling out people. So why call out him? Why? Well, he’s still running, er, cutting, marathons, and he DID deny rightful AG podium spots in the past. He was NOT victimless. I’m in my late 50s and after a lifetime of mediocre running, and thanks to so many people my age dropping out, I find I can sometimes claim an age group award at a small race. I can attest that it’s a fantastic feeling, and I’d hate to think some selfish bozo denied that feeling to me or someone else by cutting a course and not DQing himself. If the guy pays the race fee, I don’t care if he eats a bagel, wears the shirt, and even takes a medal, but elbowing aside someone who’s earned a place, stinks. I feel soooo contented, satisfied (dare I say proud?) when I podium in my age group. It makes ‘it’ even better than the satisfaction of completing the race in reasonably good order! The latter may (may) be my response 4 days later! Because he STOLE podium spots from legitimate marathon finishers. He gives his full name when he signs up for races and cheats. Perhaps that is his reason …..just to be spiteful and deny rightful podium spots…..
Perhaps he is supporting someone else rather than running for himself? He may have a friend who he jogs with regularly who runs (and completes) marathons. Perhaps Richard is not motivated to race personally and knows that he is either unable or willing to run the full 42km but likes to run with his friend for a reasonable part of the race and so, rather than bandit the race without paying, he pays his entry fee and drops in and out as appropriate. He would have no motivation to “correct” any race results as he doesn’t consider himself a real part of the race. Or perhaps – and I don’t know these races or their courses – perhaps those particular marathons use some roads / bridges / routes that are otherwise unavailable to run. For example, here in Auckland, New Zealand the only way to run over the Auckland Harbour Bridge is to enter the annual Auckland Marathon / Half Marathon. So I do, as do thousands of others. Of course, we mostly enter the half marathon but if the full marathon was the only option I’d consider entering and then dropping out after the bridge. And I’d go through the finish just so there was a record of me “completing” the course and nobody had to waste time looking for me when I “disappeared” en route. So two possible explanations, but I claim no special knowledge of Richard’s motivations. These wouldn’t apply in most cases but if he is making no claims on social media to have completed the races then one of these, or something similar, may be valid. Did he collect the age group award or a trophy? It could be that he just likes to participate in these races to keep active but he doesn’t care about completing the whole race. He is not using his times to enter Boston. If he is not collecting age group awards either, this explanation becomes more likely and this would become a case of him just failing to report to race officials that he did not complete the race–and possible illicitly collecting finisher trophies. 1) Why can’t Derek pivot towards understanding the psychology of these people? Thus far he’s had a psychologist and ethicist on his podcast. I don’t think it’s fair for you to judge the content of this blog based on your idea that it must narrowly fit some vision statement. 2) As Mark pointed out, this is not a “victimless” crime. By robbing people who put in the hard work to earn the AG awards, he is actively taking something away from people who actually earned it. I suppose he gets to enjoy the buzz and atmosphere of the event without the full effort of actually covering the full distance. He’s short changing himself, surely the sense of satisfaction would be greater if he quit the course cutting. It’s quite sad. I’m quite certain that for some people, cheating IS the event. It’s not the medal, or the accolades, or anything else but the rush to get away with it. This would be a very interesting line of thought to investigate with a sociologist/psychologist on the podcast. I am convinced that this became Kip Litton’s primary motivation. He would finish races wearing a different shirt or shoes to the ones he wore at the start. It was almost as if he was saying, yes I am cheating but you can’t work out how I am doing it.